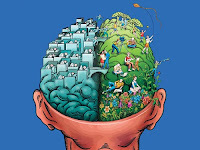 The Human Brain reacts to electromagnetic impulses and scientists have figured a new way to boost creativity and stimulate the inner genius inside each one of us. The Thinking Cap is a device which uses tiny magnetic pulses to change the way the brain works and has produced remarkable results in tests. This technology is also known as Transcranial Magnetic Stimulation ! 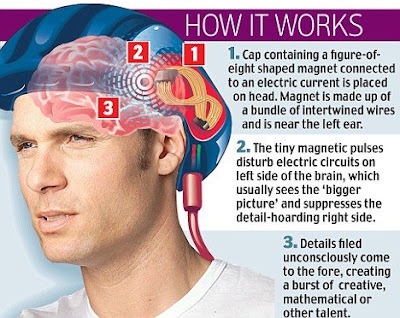 The Sydney University researchers used a cap equipped with magnetic coil to zap the left side of the brain. This side generally sees the 'bigger picture' and suppresses the detail-hoarding right side. In one experiment, volunteers were asked to draw a dog, horse or face from memory before and after being zapped for ten to 15 minutes. Four of the 11 volunteers produced more natural pictures after wearing the cap. The technique has previously shown promise in treating depression and schizophrenia. Researcher Professor Allan Snyder believes the experiments show we all have hidden talents, we just have trouble tapping into them. He says 'I believe that each of us has within us non-conscious machinery which can do extraordinary art, extraordinary memory and extraordinary mathematical calculations'. This can certainly enhance latent abilities, strengthening neural pathways allowing creativity to persist without the Cap. I believe our mind / brain / consciousness is already receiving strong electromagnetic impulses from the center of the milky way galaxy and as we get closer to the point of crossover ( 2012 : Sun's ecliptic plane with the galactic plane ) the intensity will only increase opening up the energy chakras within all of us. This activation of the dormant chakras allows the Kundalini Shakti to move up freely clearing all blockages and heralding a new awakening of global consciousness !